In the book "The God of Small Things" by Arundhati Roy, the character Velutha is tangled in a web of familial, cultural, and romantic loyalties. The lyrics for "The God of Loss" were inspired by Velutha's attempts to preserve his humanity in the face of those competing forces. We were introduced to the filmmaker Andrew Benincasa via a mutual friend, and although we conveyed the genesis of the song and spitballed a few ideas as a group, the final storyline was largely Andrew's vision. 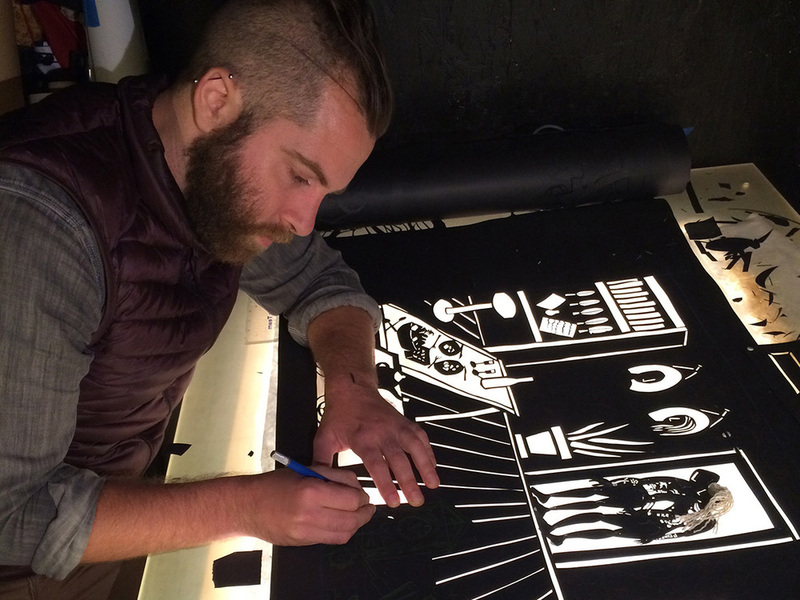 Below are Andrew's remarks on the video and some behind-the-scenes photos of his process. 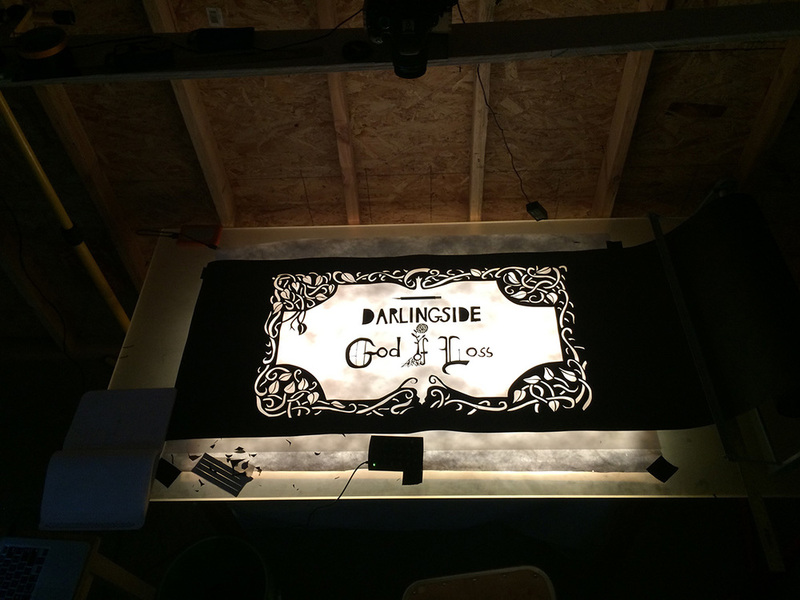 "The band Darlingside had approached me with some songs to make a video from, and I thought of a bunch of different treatments for a few songs before an idea for The God of Loss finally clicked. The song is about loss, and the flow of time, and asks the question about what are the things we can take with us as we continue to lose so much - I thought this song was thematically perfect for a paper-cutting, because paper-cutting is the process of creating by taking away. You take a blank piece of paper and making an image by removing pieces, and shape and story are formed by what is lost. This seemed like a potentially potent metaphor for human experience, and that's the seed I grow this video out of. "The video is stop-motion paper-cutting and puppetry. I built a rig (see the photo) in my studio in Red Hook, Brooklyn, that is a light table with a translucent cutting mat on it, and a camera mounted above. I attached a spool on one side with ream of black paper on it to pull form (I've done narrative scrollwork before in my live shadow puppetry shows - in that biz we call them 'crankies'). After making the storyboard, I would roughly do a scene a day, sketching, cutting, choreographing the puppets and my hands, and editing the scene to get the timing right. "During the weeks I was making the video this September, studiomates would walk by and see what I was doing - meticulously cutting and shooting for long hours, day after day - and they would joke about how tedious and boring the work must be by saying their favorite line, "You must use meth." While I don't (would that help me work faster? ), to me it's funny, because the work is always absorbing and never boring; laborious and bone-wearying and a lot of hours, yes, but never boring, because you know you're building up a beautiful piece, and you'll be able to share that piece with a lot of people. Executing this vision for Darlingside's soulful song has been a huge pleasure, and I'm so excited to send it out into the world."